Our 5ft. 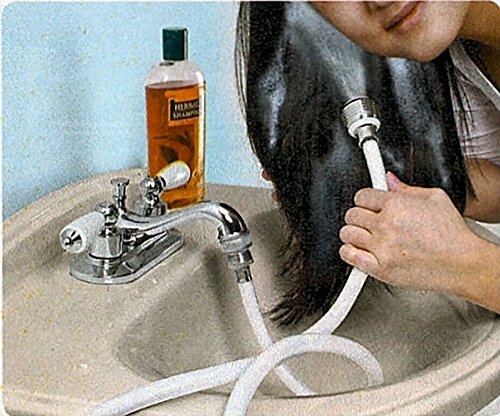 Indoor Sink Hose Turns Your Sink Into A Handy Shower! Install to any standard faucet to create a handy spray shower at any sink. Great for shampooing your hair, watering plants, bathing babies, bathing pets and more! Easy adaptor fits most sinks. Reinforced vinyl hose with 2 position spray/stream nozzle. Measures 5 Feet in Length. Turn Your Sink Into A Handy Shower! Great for shampooing your hair, watering plants, bathing babies, bathing pets and more! If you have any questions about this product by Sink Hoses, contact us by completing and submitting the form below. If you are looking for a specif part number, please include it with your message.